Do you need to create persuasive presentations, webinars, or videos? No doubt you’ve attended presentations or webinars where the presenter read the text from slide after slide — and you started checking your email. Was it persuasive? No, IT WAS BORING! But this happens all the time. You could get 10%, 20% or even 50% of the people in your audiences to pull out their credit card and buy from you? Your audience actually paid attention to you and then implemented your training or proposals? People immediately understood what you were trying to say and agreed with you? Discover simple techniques based on solid research that everyone can learn! See great before-and-after examples that you can use as models. You’ll hear how one marketer used these techniques to increase his conversion rate from 50% to 70%. Get cool animation techniques and technology tips that will make the process easy! "Ellen's tips on how to give an effective sales presentation incorporating PowerPoint was very lucid and valuable for our women professionals' monthly meeting. 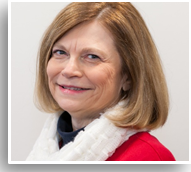 Ellen has clearly thought through the mechanics of selling and buying and offered practical advice which I know our members will be incorporating in their presentations." - Helen Foster-Grimmett, Founder and VP, Enlightened Communications Int'l. Bonus 1: E-book "Slide Design for Non-Designers"
Bonus 2: E-book "The Lost Art of Persuasion"
I absolutely guarantee that you will be happy with what you learn during this course. If you are not satisfied, let me know within 30 days and I’ll refund your money. There is no risk to you when you sign up for the High-Persuasion PowerPoint Presentation Program. so you can see how I do it and learn to do it yourself for future presentations! 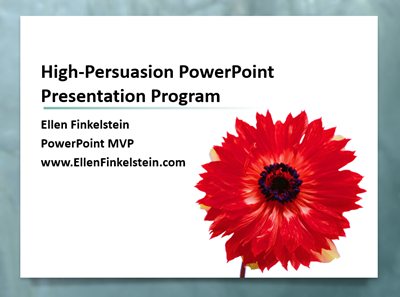 The High-Persuasion PowerPoint Presentation Program, plus 7 valuable bonuses!